In this modern, busy world, you’re probably walking more than you think – so make every step count! In fact, the average Brit clocks up a 3,000 steps a day! That sounds alot! But is it? This Energy Pedometer’s movement sensitive step counter with sensitivity adjustment measures the number of steps taken when walking or jogging. It’s built in belt clip allows you to wear your pedometer at all times. So you can knowingly increase your movement and step into a healthier lifestyle!! If you want to make custom Oregon Scientific Energy Pedometer with your logo,slogan,telephone,website,email , please send us your design or give us instructions about your imprint.We'll send a free virtual art proof for your approval,you can ask a real sample with logo before production too. 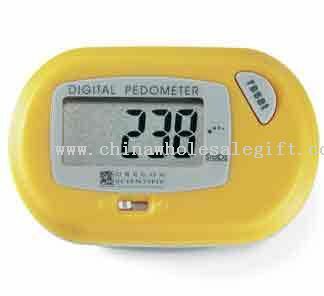 Our Oregon Scientific Energy Pedometer is popular as promotional,advertising, business,corporate gifts.